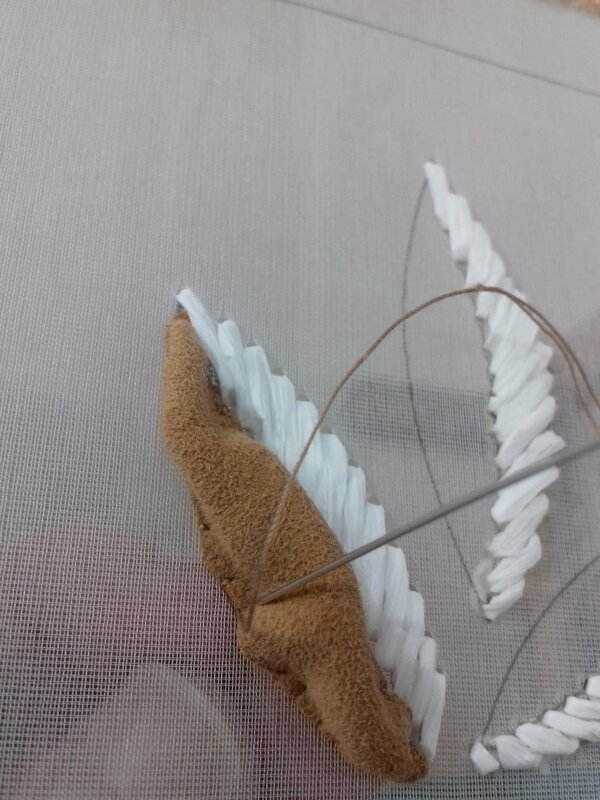 With the impatience of a child on Christmas Eve I spent most of the morning stretching the organza pattern across the embroidery frame. Finally I reached for my materials packet and it felt like Christmas morning beneath the tree, carefully removing the wrapping paper to catch the first glimpse of long-awaited toys. I spread the bags and parcels before me, wondering which one I would get to play with first! 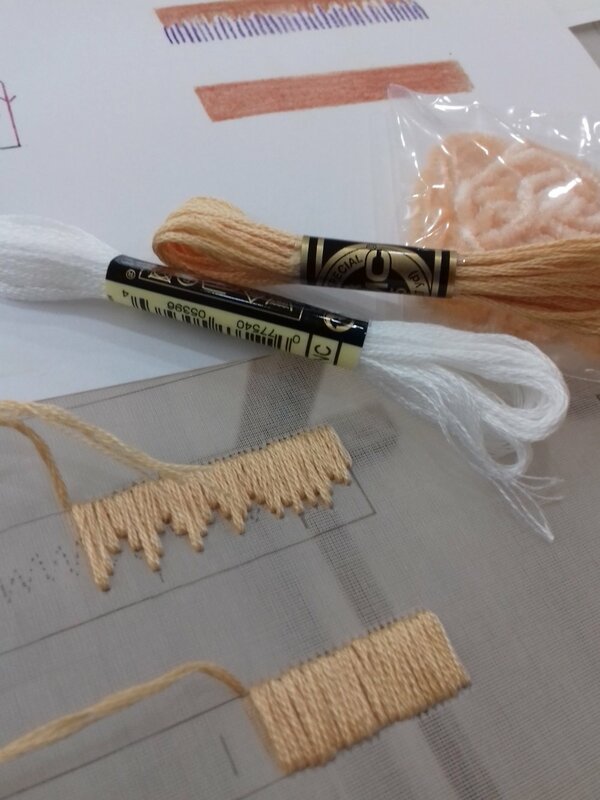 The sampler starts with exercises in passé plat or satin stitch using white cotton embroidery floss and salmon pink chenille. 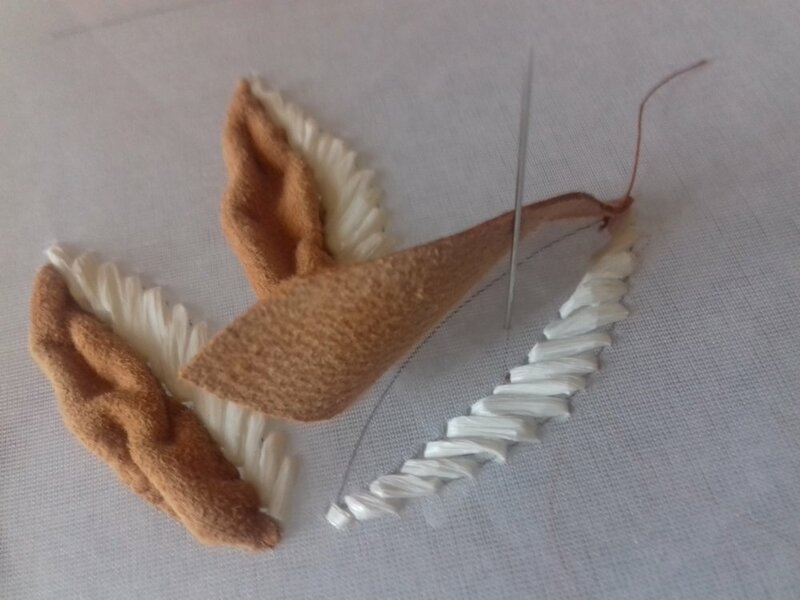 I lamented my lack of practice as the stitches began to slide to the left, seemingly with a momentum of their own, like a sprinter with their head bent, slanting towards the finishing line. 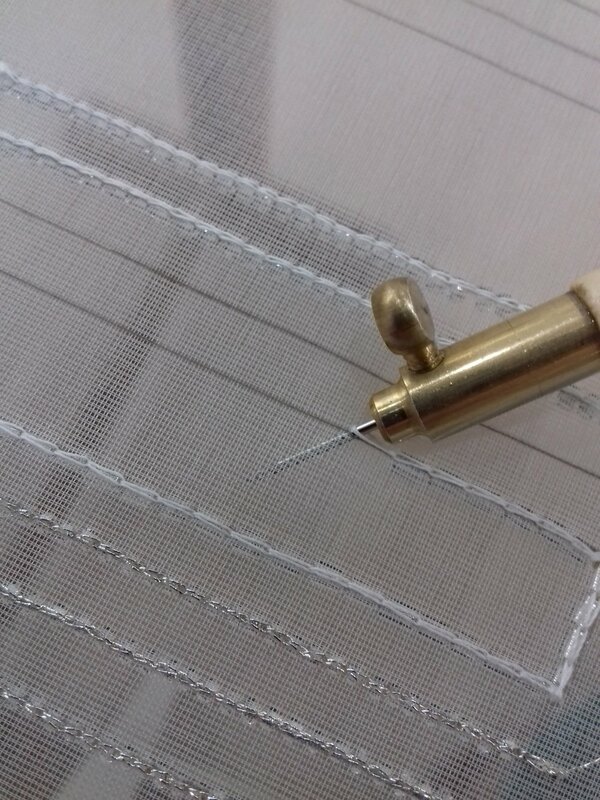 Distracted by my diagonal satin stitches, I forgot the trick I had learned for transferring beads on to the bobbin thread when I made the butterfly brooch… A loop is prepared on the thread that has the beads, the bobbin thread is passed through, the knot is tightened and they glide across with ease. The ‘thrrrrr’ of precious glass beads tinkling on the floor of the atelier announced my mistake of making the loop in the bobbin thread. The tiny beads winked up at me, delighted with their escape! 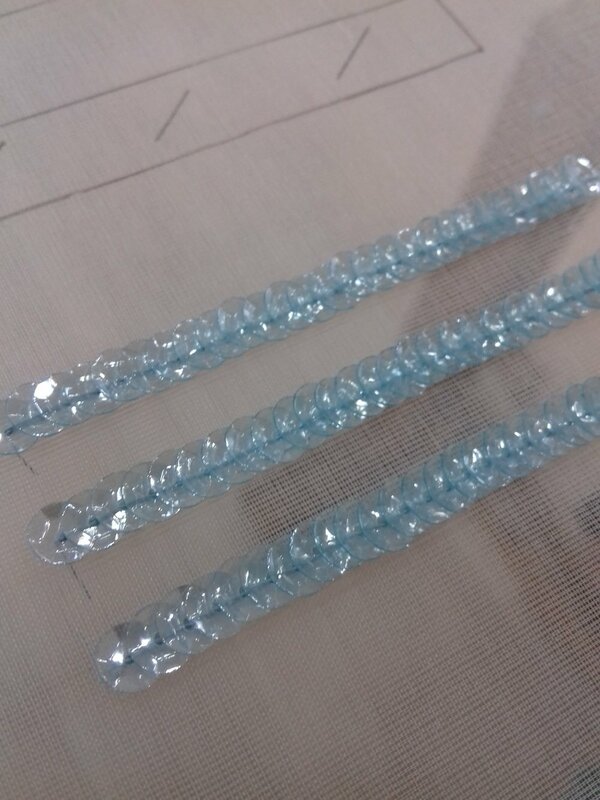 I took a deep breath to relax, slow down and concentrate on applying small and large glass beads in rows, turning corners and merging lines with transparent tube beads, applying blue cup sequins in rivers, graduated chain stitch in silver thread and single strands of embroidery floss. 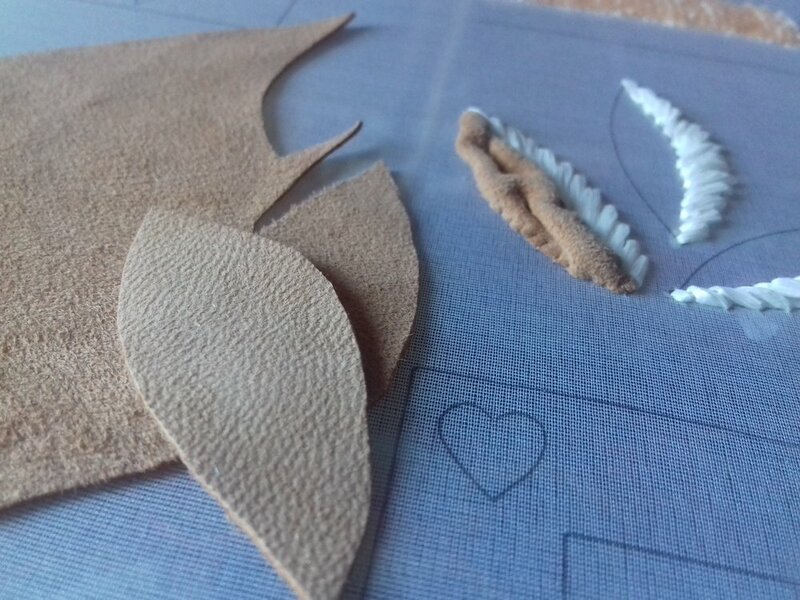 The final exercise was a leaf motif with one side in diagonal satin stitch using rafia and the other in leather using a technique to form wrinkles. And like a child after the excitement of Christmas Day I was exhausted by the end of the week! There was 2 to 3 hours of homework each evening and I was relieved that I had taken the advise of the school and spread my classes across the week. I knew that I would need to get in line and straighten out my stitches as it were, which gave me the perfect excuse to visit Marché St Pierre!